Our stop in Naples, Italy was the most frustrating day of our Disney Mediterranean Cruise. Rather than explore the port town famed for its glorious pizza, we opted to hire a private driver/tour guide to take us to Sorrento and Pompeii. It’s not that these locations were bothersome or not worthy of a visit – quite the opposite, in fact! Hiring a private guide seemed like the best way to visit both Sorrento and Pompeii in one day with our then two-and-a-half-year-old daughter. Plus, this was before the economy crashed so we were doing pretty well financially and could afford such extravagances. In retrospect, I wish we would have just taken the Disney Sorrento and Pompeii Excursion and saved ourselves a lot of money and frustration! The tour company we hired had specific suggestions for how to spend the day, but I’m pretty type-A and had my own ideas; this didn’t seem to go over too well. I requested that we tour the Pompeii ruins in the morning to avoid the heat of the day and then head to Sorrento for a relaxed lunch and shopping. 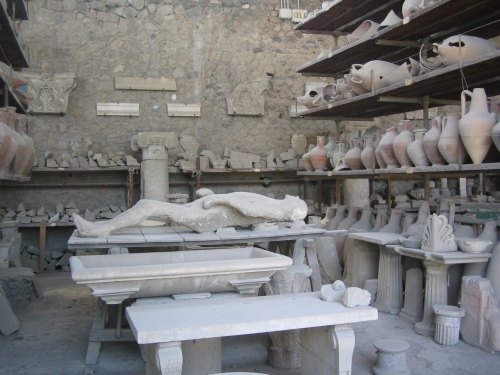 However, at pick-up our driver informed us that our private archeological guide would be meeting us at 2:00 pm so we would have to drive to Sorrento first and eat lunch in the town of Pompeii instead. During the two-hour drive, I sat in the backseat with my toddler, Karissa, reading books aloud, playing with lace string boards, and trying (without much luck) to keep her entertained. 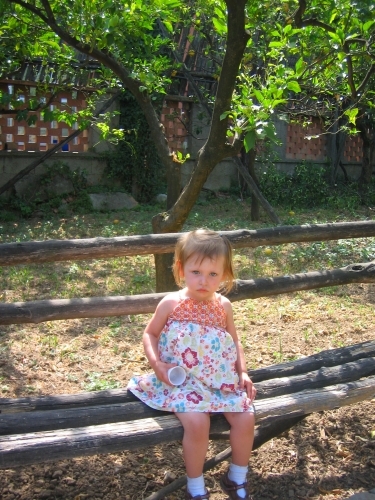 Once we arrived in picture-perfect Sorrento, my husband and I took our daughter first to L’Agruminato, a darling citrus garden recommended in Rick Steves’ Italy. There Phil and I tasted and purchased a bottle of Limoncello liqueur, for which Sorrento is famous. This mixture of vodka, sugar, and citrus is mostly sweet, a little tart, surprisingly strong, and all together good. While wandering through the Sorrento’s plentiful shops, I found several beautiful ceramic centerpiece towers of lemons. This is exactly what I had envisioned purchasing in a town known for its lemons and pottery. 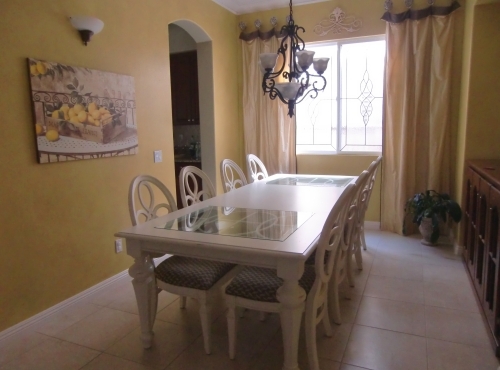 I knew it would be perfect in my rustic, yellow dining room with the long white table. I couldn’t decide which to purchase and knew we were on a strict timetable, so my husband and I dutifully marched back to the car. Here’s my dining room. Hmm…what’s missing? I asked the driver if we had time enough for me to dash into a store to purchase one of the centerpieces. He told us that he was illegally parked and we really had to hurry to get to our fabulous lunch reservation in time and besides, I need not worry because these items could be found anywhere throughout all of Italy. Needless to say, I spent the remainder of our trip searching for my beloved lemon centerpiece to no avail. I have searched and searched for something similar and have found but a few options stateside – all of which are three to four times more expensive than what I could have bought in Italy. This has convinced me that we are destined to return to Sorrento, if only to finally purchase my long sought-after ceramic sculpture! Don’t Be Afraid to Speak Up! After our one-and-a-half-hour drive to Pompeii (throughout which, again, I attempted to amuse Karissa), we pulled up to a “restaurant” literally across the street from the Pompeii ruins named simply, Snack Bar. It featured giant, laminated photos of pizza and other eats on its outdoor menu. I asked our driver if this was the place where he “made reservations.” When he said yes, I requested he drive us to a different restaurant for lunch. 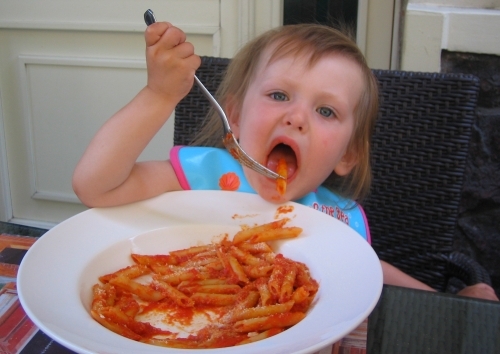 We came all of the way from California and food is part of the joy of Italy. We did not want to waste a precious lunch snacking on tidbits at the fast food joint across the street from a tourist destination. He protested, but my stubbornness won out. We dined at a small, unassuming café in the modern town of Pompeii. I was feeling a bit stressed out by the hurried schedule of the day and our tour guide’s insistence in telling us all we were missing by not including a visit to his hometown of Amalfi (which was part of their standard tour package). I, therefore, ordered a bottle of red wine to accompany our lunch. Our meal was beyond delicious, as you can tell by this photo of Karissa gobbling up a huge bowl of penne. After a giant plate of pasta and half a bottle of red wine what you really don’t want to do is go walk around in the sweltering sun for a couple of hours. But that is exactly what we did. Now, my husband knew that I had been entertaining our little one in the car all morning. He also knew that I was really excited to see Pompeii as it had been on my bucket list ever since I was ten-years-old and I had learned about it in elementary school. Our archealogical guide knew none of this and therefore seemed quite put off by the fact that I kept leaving my poor husband to chase after our over-tired, red-faced toddler while I snapped photos and asked questions. In retrospect, it would have made sense to explain our situation to our guide so that I could have just listened and enjoyed while Phil and Karissa ran about. Instead, our guide kept pulling my husband in and re-explaining things to him (which Phil had little interest in), drawing out our tour even longer and making Karissa all the more antsy. I hate to say “I told you so,” (not really!) but my plan to visit the ruins in the cool of the morning to allow for a relaxing lunch and shopping in Sorrento would have been ideal. I don’t know if there was much I could do to change this. I made my desires clear when booking our tour. It’s not that I don’t like tours of any kind – booking a tour can be less stressful, easier, educational, and fun but you give up control of your vacation itinerary when you go the tour route. I guess if I wanted total control, I should have rented a car. Even in the stifling heat, with a rambunctious toddler, and an annoying start to the day, I loved Pompeii. Since sixth grade I had tried to picture this ancient, doomed city that was covered ash in a volcanic eruption by nearby Mt. Vesuvius in 79 A.D. 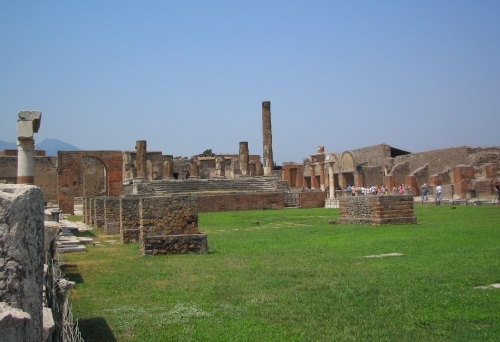 In fact, the first piece of fiction I remember writing was about Pompeii as part of an assignment for my English class. (Oh! How I wish I could find that story now!) There is something so magical about being someplace you’ve tried to imagine nearly your whole life. For me, seeing Pompeii ranks up there with seeing the Eiffel Tower or the Roman Coliseum for the first time. Besides, like those citizens of Pompeii from so long ago, you never know when you’re time will be up and you may be covered with a heap of volcanic ash. As long as you’re here, you might as well seize the day! The outline of a body of a Pompeii resident who died in the catastrophic volcanic explosion in 79 A.D.
Cruising allows you to take in a lot of sites in a short period of time, with little planning, all while unpacking only once. But it also means making compromises due to limited time in each port. The next time we come to this region of Italy, I hope it is for longer than just one day. I dream of days filled with leisurely lunches of pasta and wine, strolling through shops unburdened by the restrictions of a timetable, and finally bringing home my darling Italian ceramic centerpiece of lemons. Have you ever passed up purchasing or experiencing something on vacation that you later came to regret? Let us know in the comments! A note from the Travel Mama: My family paid for this cruise and I did not receive any compensation or goodies from Disney related to this story. I will always let you know if I receive any money or products related to a blog post. I passed on many experiences and purchases during our year living in Spain and traveling throughout the Mediterranean. However, I hate rushed and over-scheduled days so I’ve decided to have no regrets and enjoy the whole bottle of wine. Thanks for the reminders to speak up and make the most of things! Glad you finally got to experience Pompeii! I love your advice: “Seize Opportunities Before It’s Too Late.” A lot of wisdom in those six words. Thank you for that. We just returned from 6 days in Sorrento. We stayed in the Januzzi on the Piazza which allowed us the freedom to roam in all directions. We took a tour bus recommended by the hotel along the Amalfi coast. Beyond wonderful experience. The next day we took the cheap regional train to Pompeii. We rented head sets and took our own tour. Fabulous. Then we ate dinner outside overlooking the bay of Naples at the Belevue. The food was expensive but the service to die for and all the while a fantastic piano player causing tears of joy to flow. It was the most wonderful day of my life! You might want to try this after your child is grown. Ours are all in their 40’s now. We walk at a slower pace but we still feel young enough to cry tears of love towards one another when the view, taste and sounds fill our hearts to the brim. Yes, I would have like to have brought more items home, but my memories will last a lifetime. I wanted the ceramic frogs in the Januzzi but they were not for sale. Thank you for your post. Ruthie – I’m so glad you had such a wonderful time in Italy! Reading your comment makes me want to go back. How great that you are seizing the day & traveling the world! I returned 2 weeks ago from a Disney Mediterranean cruise, and was thinking of blogging about it. This was the best blog I found out there. Like you, Colleen, I felt a bit constrained by the excursions and short time in each port. The question about shopping really got me, mainly because of my experience in Florence. After the long drive to Florence from port and morning site-seeing, we had 2 hours on our own. After a fabulous lunch of pasta with fresh clams and wine, I had a little over an hour to shop. My first stop was a gold shop, where I purchased a necklace and bracelets, which I love! Unfortunately, my credit card would not go through immediately and we were on hold with them for 1/2 hour before the charge was cleared! I had even notified them before leaving for our trip, but because the charge was over $1,000 I had to wait to talk to a manager. As a result, my shopping time was cut short and I never had time to look at all the beautiful leather jackets that were everywhere! Lynda – Oh! I am so envious of your recent Disney Mediterranean cruise! We had such a fabulous time on that vacation. Although it was frustrating not to have enough time in each port, it was also wonderful to get a taste of so many destinations. I can’t wait to get back to Europe and stay longer in the destinations that really interested us. Maybe you are destined to return to Florence so you can enjoy shopping their markets and stores some more?! I have learned that if I see something I like, buy it. My brother and his wife recently came on a trip with me, and I know they thought I was impetuous, but she saw a wooden lazy Susan she loved, and I just bought it. Everyone said we’d probably see plenty more, but we never did. So glad I don’t 2nd guess when on vacay anymore! So smart, Christie! I’m the same way now! My husband & I are preparing for our first Mediterranean cruise this upcoming May. We want to make the most of our time in each port so I am researching everything I can get my hands on. I know, no matter how much one prepares, things often still don’t go as planned…but I will still try my best anyway. Thank you for sharing your experience. I found the information very helpful. Virginia – So glad you found this story helpful! Research says that people actually enjoy their vacations MORE before they go, than they do during the trip so research away! And enjoy your Mediterranean cruise!